I keep a list of things I would like to make for every season. On my summer list? 70s floral sundress with bottom ruffle. I didn’t really want a maxi dress, so I was pleased to find this pattern, which seemed to offer everything I might want! I must have stalked it for months before breaking down and buying a size 32. My bust is 31.5″, and I had to remove 1/2″ from this dress, so the sizing was accurate. If I were to make the dress again I would remove some width from the back – I have a very narrow back, and there is a little extra fabric there. I might play around with the back strap placement also, to get a nicer back fit… but it is totally wearable this way, so I’m not going to worry about it. I wore this dress to a casual-ish audition tonight, and then after that I went to Starbucks, where the barrista gave me a free chai latte, after he complimented me on my dress, and I said that I made it. He called it the “awesome dress” discount – ha! To be fair, this is the barrista that my husband calls “Jessica’s Starbucks boyfriend,” but never you mind. I do love my new sundress! It looks great and yes, the ruffle was essential! Also your hair color is glorious in these pictures. You totally earned the “awesome dress” discounted latte 🙂 The dress looks lovely! I love your dress, you did a wonderful job! I really like the back buttons and ruffle hem, but most of all it looks so very comfortable. Surprisingly (to me) this is the first time I have visited your blog… I will be coming back to see what other lovelies you create! I realize you made a post about this already…but.. where’d you get your shoes? They are awesome. Oooh I love your dress, it totally deserves the nice dress discount. The ruffle’s so pretty, and it makes the skirt a nice length for something in between a maxi-dress and a short dress. Once again, another lovely creation! That’s great! And the colors are AMAZING on you! The dress is fabulous! Enjoy wearing it this summer! The fit looks superb. So pretty – especially with the shoes! beautiful! the style and colours really suit you. might have to hunt this pattern down, I’m in love with those back buttons and criss-cross straps. Cute dress! And interestingly, it doesn’t look “dated” at all. Totally worthy of the discount … it always helps to make nicey with the Sbux baristas. Very cute dress. My mother made that dress for me in 1977 (I was in junior high) out of pink and white gingham! Yours is lovely. Lovely summer dress! It’s fabulous! Cute cute so cute.You did a great job! You inspire me. Kudos on the dress and the latte! An excellent pattern for you and so pretty! Fun! My mom made me a dress from that pattern (she bought it when it was new!) when I was a teenager out of a cute print with red buttons attaching the straps. Yours looks great! fabulous sundress, inspired me to move from knitting to sewing i think! after so much baby knitting a lovely dress for me may well be the treat i need to inspire me. Beautiful dress. I actually made that same dress in 1977 and wore it to a high school dance! Mine was in a multi colored cotton stripe and I loved it. Thanks for the memory and enjoy your dress. It looks great on you. Fantabulous. The color is beautiful! Looks very comfortable, & fun. This post made me laugh! Next time I go to Starbucks, I’m going to demand the Awesome Dress Discount (really, it’s the least they can do;). Everything about this dress is perfect: The shape, the straps, the buttons, the ruffle, the buttons. Ah! I believe you said you’d been considering the Parfait (I’ve been wavering on that as well) but I think this pattern is so flattering with the use of different details. I’d choose this one, frankly, because I think it’d be more flattering on my figure. Thanks for the inspiration! OMG I think I made this when it came out originally. If not this exact one, something just like it. It is an awesome dress and the colors look absolutely gorgeous on you. Beautiful! Ooh!! I have this pattern. I’m so happy to see it made up! I think it looks fantastic on you. I was a little leery of the buttons so have not attempted it yet. I also have the little girls pattern that matches it (Simplicity 6996) which I assume belonged to the same person as I found them both at the same thrift store. I can’t wait to browse your archives. This is adorable. I think it’s so sweet! But I’m a sucka for anything 70s. 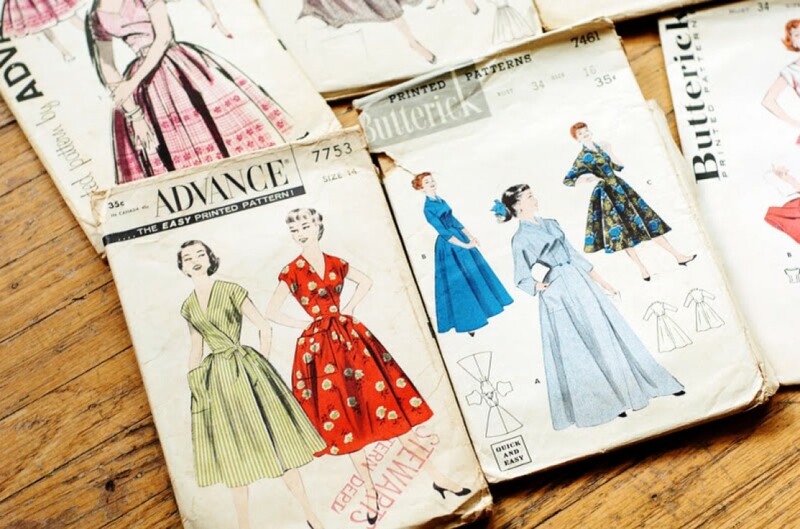 I am SO thrilled to have found this site as I just started taking sewing classes and am about to begin working on my first dress. It’s all so exciting and intimidating at the same time! I did that exact same pattern while I was in high school in a light weight denim. Had classmates asking where did I get it? You did a wonderful job with it. Very 70s looking! The ruffle was absolutely the correct call. I love the final dress! It’s a total winner! This is gorgeous! I am about to make this one, but have been hesitating as I wondered if the buttons would pull and stretch. I was thinking of putting in a zipper instead, but that would detract from the look. Have you had any problems with repeated wear and tear on the buttons?